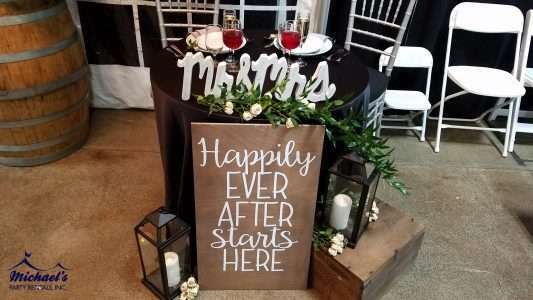 Did you get a chance to come visit us last weekend at the 2018 Springfield Wedding and Bridal Expo at the Eastern States Exposition? If not, here’s what you missed! 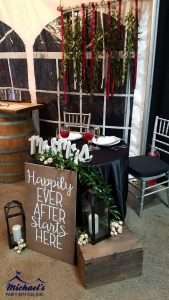 Our first display table was a mock sweetheart table. 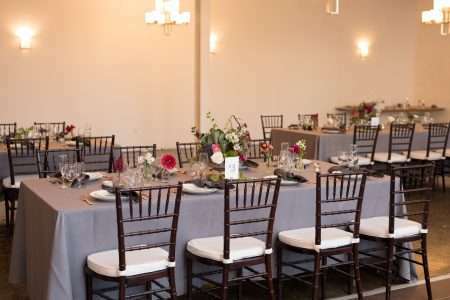 We used our 36″ round pedestal table and drapes it in a black satin linen and paired with with silver napkins and chiavari chairs. 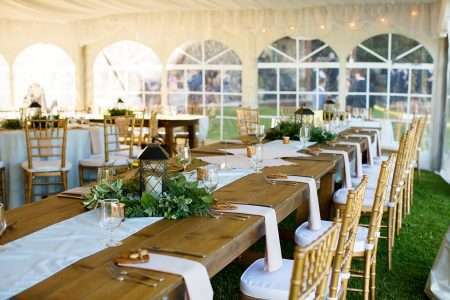 With a little help from some loose greenery, flowers, lanterns and an old wine crate, we made this table look wedding ready! 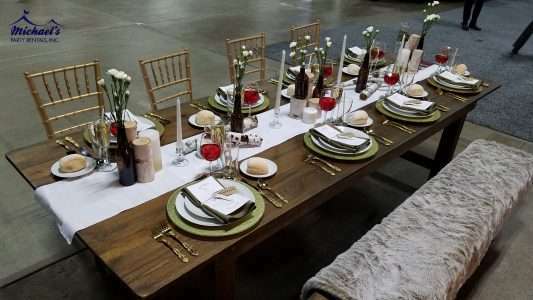 Our next table display is a rustic glam inspired table. 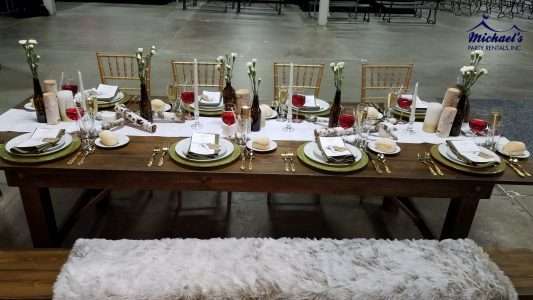 We started off with out 9′ long farm table and lined the center of the table with tapered and pillared candles, birch chunks and branches, and beer bottles with white flowers. 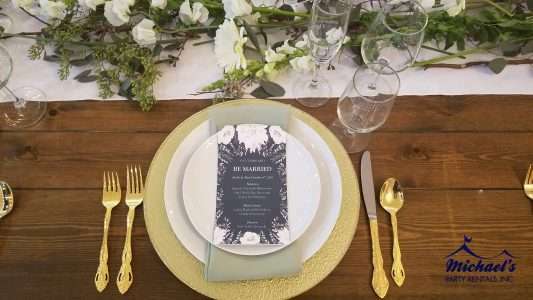 We then added tons of gold accents to really make this table shine! 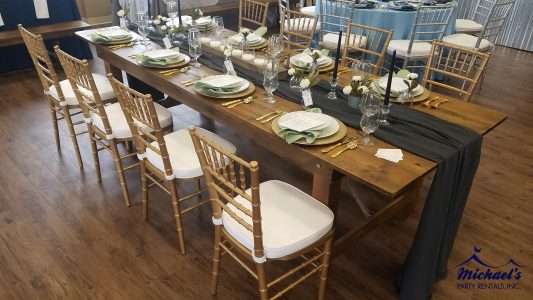 We paired the table with gold chiavari chairs on one half and our farm bench on the other side. 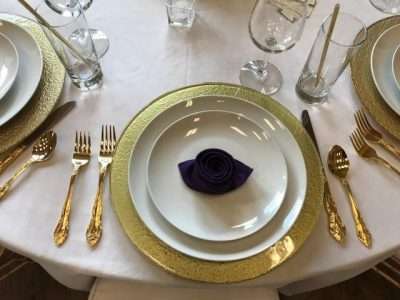 The finish product was stunning! 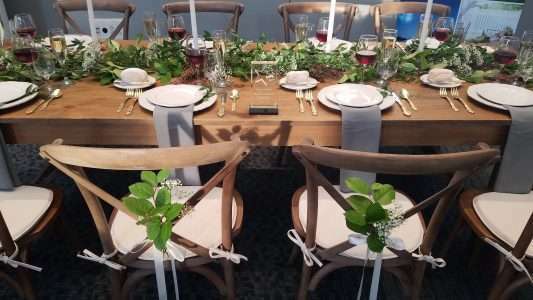 Our last table display we created was a sweetheart high top table. 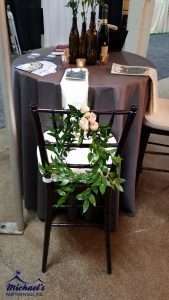 we used out nova solid pewter linens and out mahogany chiavari chairs for the base of this display. 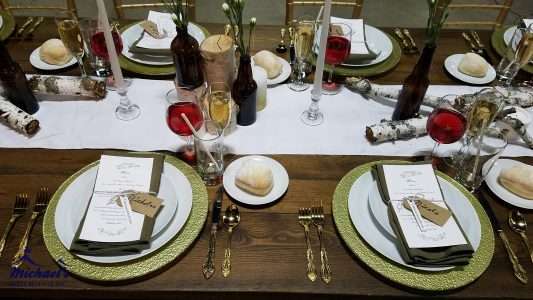 we then dressed the table up with beer bottles with tons of greenery and white flowers and floral crowns for the back of the chairs! 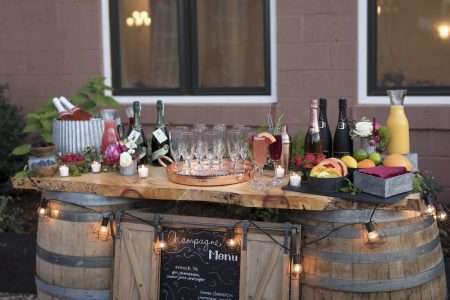 If you want to recreate any of these tables for your next event, give us a call today! 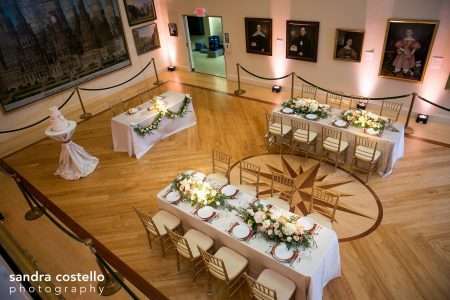 That’s right; we had the opportunity to work on two different stylized shoots at the Springfield Museum. 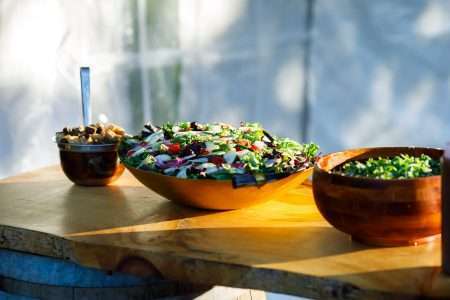 For this shoot, we teamed up with Sandra Costello Photography. Between Sandra and our event coordinator they designed a mock wedding. 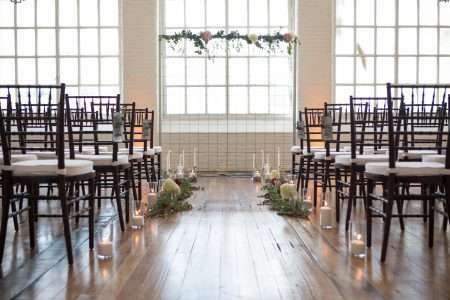 The fake ceremony and reception took place in the Blake Court of the D’Amour Fine Arts Museum which had beautiful hard wood floors, high ceilings and elegant paintings on the walls. To match the theme in the room, we went with a renaissance theme. 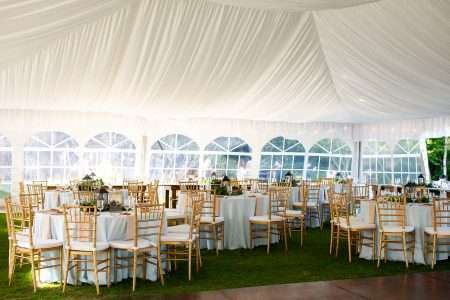 We started off with a neutral champagne linen to blend with the current colors in the room. 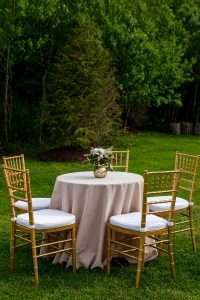 From there we added a bold copper napkin and gold chiavari chairs to add some color. However the real pop of color came from Durocher Florist. 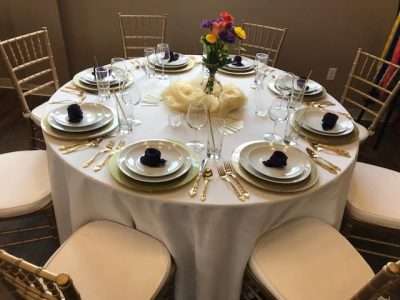 They created beautiful floral arrangements for the tables. 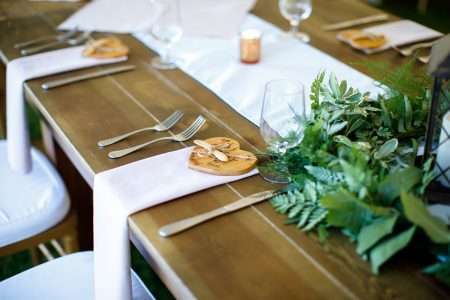 We opted for heavy greenery loaded with blush and cream flowers. CJC Event Lighting put spot lights on the centerpieces and up light the walls with a blush tone. 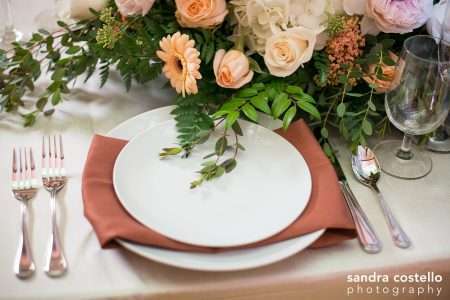 The beautiful photos shown above are courtesy of Sandra Costello Photography. 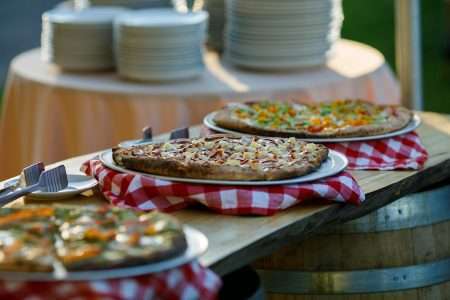 Have you attended an event at the Boylston Room in Easthampton yet? If not, you’re missing out; it’s absolutely stunning! 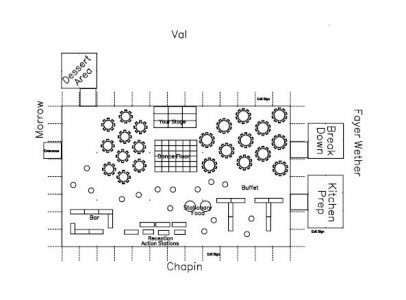 The Boylston Room has 2 different indoor event spaces and an outdoor patio. The smaller of the 2 rooms was the perfect backdrop for a photo shoot put on by the Fox and Lantern. 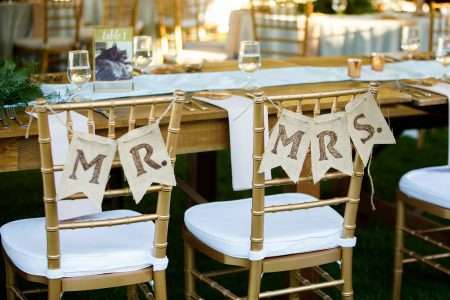 She used our mahogany chiavari chairs for the ceremony. The large mill windows let natural light brighten up the space! The Fox and Lantern created a mock cocktail hour out on the patio. 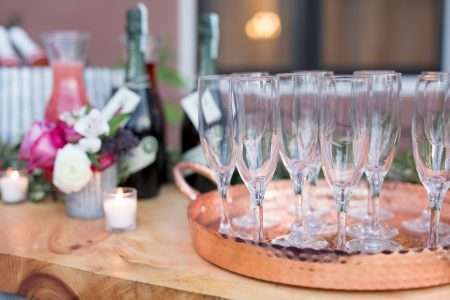 We supplied cocktail tables, chiavari bar stools and our plank bar to create a quaint cocktail reception. 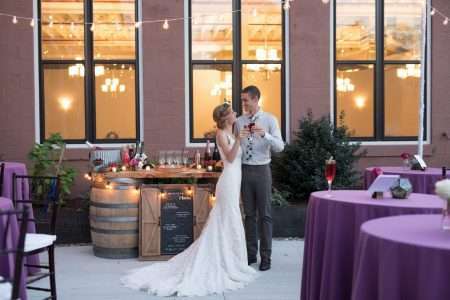 The plum linens matched the brick of the old mill building beautifully. Too continue with the berry theme, the Fox and Lantern filled up our 1 liter glass carafes with juices. 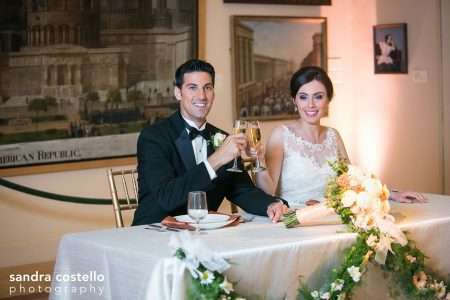 The Boylston Room’s second space is larger and was the foundation of the reception part of this stylized photo shoot. 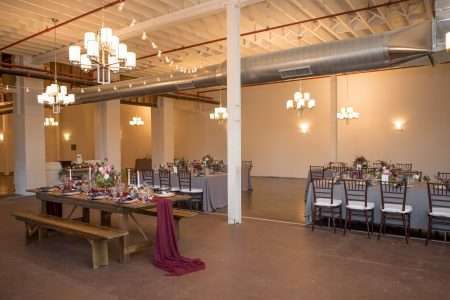 Here the Fox and Lantern staggered our tuscan tables for guests seating and used our farm table and bench for the head table. 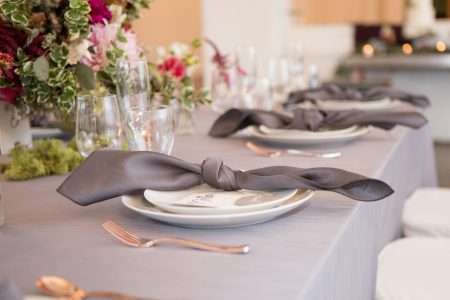 The tuscan tables were draped in pewter linens and charcoal napkins. 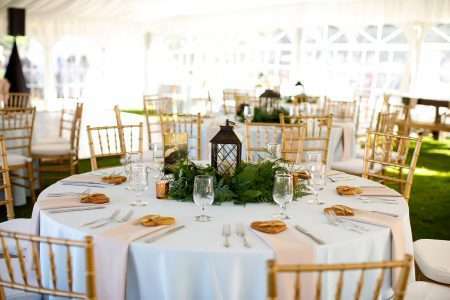 Our mahogany chiavari chairs matched the linens and flowers perfectly!